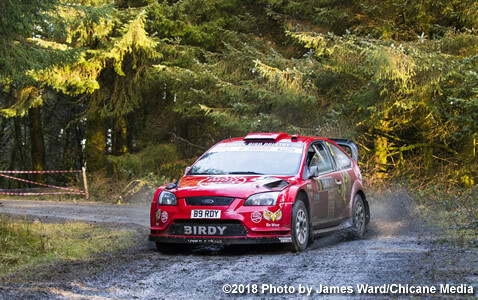 Former UK National Rally Champion Paul Bird confirmed today that he will enter Sol Rally Barbados 2018, hot on the heels of scoring maximum points in last Saturday's (February 17) visit to Conwy Cambrian Rally in the forests of North Wales to take an early lead in the BTRDA Rally Championship. This first big result for 'Birdy' and his new 'wing man' Jack Morton, the BTRDA Champion Co-driver in 2015 & '16, bodes well for the new season. The first previous winner to enter on-line, he will campaign the familiar Dom Buckley Motorsport/IRS-prepared Frank Bird Poultry/Be Wiser Insurance/Hager/Fuchs Titan Race/Loco Energy Drink Ford Focus WRC08, in which he won the Barbados Rally Club's (BRC) premier event in 2012 & '13. With five more podium finishes to his credit - second twice and third three times, most recently in 2015 - and only one DNF (he was leading after 13 stages, aiming for a hat-trick in Sol RB14, when he ran wide, breaking a wheel), Bird has easily the best record of any of the regular international visitors to the event. His record is eclipsed only by Jamaica's Jeffrey Panton (Focus WRC06), the regional ace a four-time winner, with a further four podium finishes to his credit. He is eager to add to that record, however, after a disappointing trip across the Atlantic last November, when victory in the first weekend's RallySprint was followed by retirement from the BRC Winter Rally. Having led overnight, despite a puncture on stage two, he hit some deep water too fast on SS4, letting water into the clutch, which failed, handing Panton the lead, and eventual victory. At the time, Bird said: "It was my first time back in Barbados for over two years, so to match the likes of Jeffrey Panton was very satisfying and I was confident of beating him." Ahead of Sol RB18, he is even more determined: "There's nothing like Rally Barbados anywhere else, I like the camaraderie and the fans are just amazing. Birdman is back! And I'm not coming to finish second." But he and Morton have much to do before the Caribbean's biggest annual motor sport International - Sol RB18 will run from Friday to Sunday, June 1-3, with The Rally Show and Flow King of the Hill on May 26/27. Before the Focus heads west, there are three more rounds of the Jordan Road Surfacing BTRDA Rally Series, the first on Saturday, March 3, the Cockermouth-based Malcolm Wilson Stages; it is Bird's local event, which he has won a record-equalling four times since 2004, and he is hoping to move one clear of fellow-Cumbrian Bill Dobie, who also has four wins to his credit. After finishing second on the Cambrian, just six seconds adrift of winners Ollie Mellors and Max Freeman (Proton Iriz R5), who are not registered for the championship, Bird knows the competition will be strong. Having finished runner-up in the 2013 MSA Asphalt Rally Championship and then the 2014 BTRDA series, Bird is determined to win another major UK title now he is back behind the wheel. After the Cambrian, he said: "I'm happy with maximum points as the stages today were hard work and didn't really suit me. The entry list was very strong too, so I'm especially pleased with the result. We chose the wrong tyre compound for the last three stages, as they were too soft so rather than risk it all on the last stage, I decided to roll it off and get some solid points on the board as there was no point pushing. Everything went to plan; the car was great with no dramas and thanks to the team for doing another great job. Hopefully we can carry the momentum into the next round." In a busy schedule, Bird and Morton are also entered for the ground-breaking Corbeau Seats Rally Tendring & Clacton on April 22, where they will be part of a capacity field of 120 starters making rallying history by contesting the first closed-road rally in mainland Britain to be run under new legislation, passed last year. For Morton, who lives in Hexham in Northumberland, an hour or so from Bird's home at Langwathby in Cumbria, Sol RB18 represents the furthest afield he has yet travelled to compete. He has four co-driver's titles to his name, the first in 2011, in the 1300cc class of the Scottish Championship; in 2015, he was both MSA Tarmac and BTRDA Mixed Surface Champion Co-driver, then added a second BTRDA Mixed Surface title in 2016. Last year, he competed in the ADAC Opel Rallye Cup in Germany, finishing third. Ahead of his first trip across the Atlantic, Morton said: "The furthest I've competed away from home was in Germany last year which was great experience; to come to Barbados on the other side of the world, is something I'd never thought I'd be able to do. I can't wait to come out this year to compete on such a well-known event worldwide . . . and to be sat next to one of the favourites for the win is extra special. "I've followed the rally for many years now, me and my dad use to watch the coverage when I was younger, when it got shown back home and we both loved the enthusiasm for the event no matter what car you were in the crowd went mad! Especially the Datsuns as my dad has one himself. Looking back at some of the people that's competed over there with the likes of Kris Meeke and Elfyn Evans it just makes me excited to get on the island and June can't come quick enough!" Sol Rally Barbados and Flow King of the Hill are organised by the Barbados Rally Club, which celebrated its 60th Anniversary in 2017; Sol RB18 marks the 11th year of title sponsorship by the Sol Group, the Caribbean's largest independent oil company, and the third by communications provider Flow.